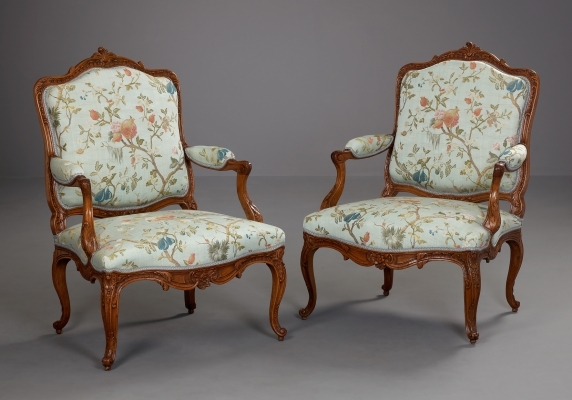 A pair of richly carved Fauteuils à la Reine on volute-shaped legs. The legs are carved with shell shapes and acanthus. The backs of the chairs are elegantly shaped in elongated C- and S-volutes. These chairs represent the best tradition of the “Style Rocaille” with its flowing lines that seem to defy gravity. The “Fauteuil à la Reine” can be recognized by the upright back, this in contrast to the “fauteuil en cabriolet” that has a declining back. The seats that are flared towards the front and the reclining armrests were necessary properties of sitting furniture of the mid-18th century. The wide frocks required by the fashion of the day needed some extra space. 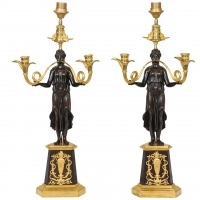 A large pair of ormolu and bronze Nikè Empire candelabra. 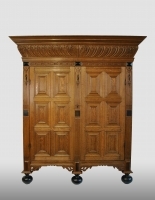 Dutch renaissance cupboard, 17th century.